Sorry there are no photos with this post but my camera has been stashed away in a box while I'm painting and I didn't feel like rummaging through them all to find it but here is a picture of the weather yesterday ......... NOT NICE!! Well, things here have been a bit hectic here, which is why there haven't been many posts this week. I have finally begun the mammoth task of painting my ceiling. My living room is quite large. It's about 17 foot wide by 35 foot long and the ceiling is covered in hideous artex!!! Not only that but the ceiling has beams, millions of beams (well that's what it feels like!) all about a foot apart so painting the ceiling is a truly horrendous ordeal! My house was once foundry workers cottages and was converted into one house back in the late 70's early 80's. Sadly, the guy who did the conversion went artex crazy. Most of it isn't too bad when painted with white matt emulsion but the ceilings are a nightmare. I have had quotes for re-plastering all the artex in the house but the cost is enormous and at the moment I just can't afford it so painting is currently my only option. I'm also painting the beams white. I know there will be people out there screaming that it's a crime to paint beams and if they were beautiful original beams made from fabulous natural wood I would agree but they aren't. I love the look and feel of natural wood however, along with his artex obsession, the previous owner was also under the misguided impression that all woodwork should be stained dark brown. When I moved into the house, every skirting board, door, beam and window frame was stained a horrible dark brown, even the staircase. Sometimes not even the same shade of dark brown. It's as though he was on a mission to use up all his spare, half-empty tins of dark brown stain in one house and none of it matched. I don't even think the beams are original, I think the guy who converted the house decided that he had a picture in his head of how a cottage should look and that's what he did. A quick mention for a fabulous site Sew Sweet Violet. If you pop over to her blog before the 26th November, you will have the chance to enter a fabulous giveawey. I wish you luck with your decorating, I am leaving mine for next year. After the horror of having walls replastered, which will be after christmas - thankfully. Although I envy you your lovely big living room, I don't envy you the job of painting that ceiling - sounds a nightmare. I decorated my much more modest living room 3 weeks ago and had shoulder and neck ache for days afterwards, thanks to looking up at the ceiling. 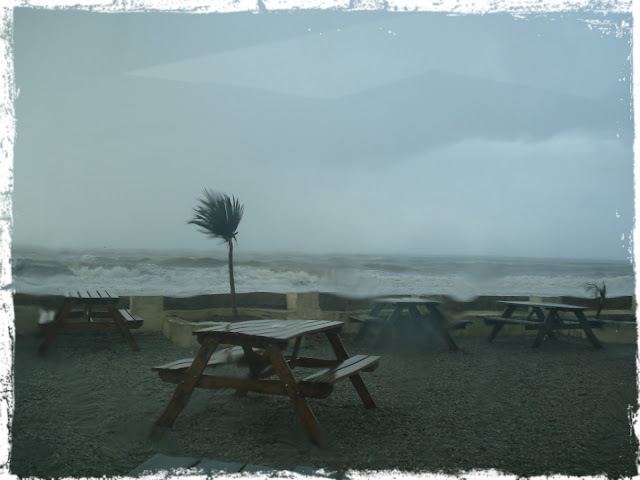 Crikey, you picked the worst day for weather to visit Seaton Beach Cafe yesterday! Awful, awful storm weather. Oh my goodness ..... what a job! just remember that it will look beautiful when you are finished.